Our Campaigns - Candidate - Roger W. Tracy, Jr.
Name Roger W. Tracy, Jr.
Info Roger W. Tracy Jr., the third generation of a powerhouse political family whose influence in Columbus and beyond extended nearly a century, died this morning after a long fight against cancer. Today was his 69th birthday. Tracy was born into politics and loved it, practicing the art adroitly as a state legislator and Franklin County officeholder, and as an adviser to GOP candidates at all levels during his long service on the Franklin County Republican Central Committee. “Nobody involved in local and state politics can say they haven't had a bout with Roger at one point or another,” said longtime GOP consultant Curt Steiner in an email late this morning. Steiner, currently a senior vice president at Ohio State University, said Tracy had accepted his fate but achieved his goal of living until his birthday. Making his initial bid for elective office as a 21-year-old senior at Miami University running for state representative in 1960, Tracy was a player on the local political scene for nearly 50 years. Tracy lost that first race, but went on to win two terms in the Ohio House from 1967-71, and later served as Franklin County auditor from 1979-84 and county commissioner from 1985-88. Even so, his dream of carrying forth the family legacy of service in statewide office was thwarted when he twice was defeated for state auditor; in 1970 by Democrat Joseph T. Ferguson and in 1974 by Ferguson's son, Thomas E. Ferguson. Tracy also launched short-lived campaigns for state treasurer in 1986 and 1998. Tracy's grandfather, Joseph T. Tracy, was state auditor from 1921-37, and his father, Roger W. Tracy, state treasurer from 1951-59 and state auditor from 1963-64. Tracy was known as a tough partisan and although he was a conservative, he governed as a pragmatist. As a commissioner, Tracy strongly supported efforts to transform the Rickenbacker airport into the thriving international cargo and economic development hub it has become. In 1985, Tracy and the other two Republican commissioners imposed a 0.5 percent countywide sales tax without a vote. The tax increase was a factor in Tracy's 1988 re-election loss to Democrat Hugh DeMoss. Tracy punctuated his keen Irish sense of humor with Letterman-like zingers, often making friends buckle with laughter. His longtime wife, the former Elizabeth Anne Ebel of Tiffin, is employed by the Ohio Republican Party and for years they were ubiquitous at party events, including a number of GOP national conventions. 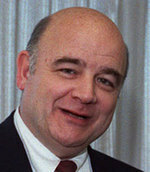 Tracy was superintendent of the Ohio Commerce Department's Division of Savings and Loans from 1975-78. In 1989, Tracy became one of the earliest organizers in central Ohio for Republican George V. Voinovich's gubernatorial campaign. After his election in 1991, Voinovich appointed Tracy the state's tax commissioner, a position he held through Voinovich's eight years in office. While serving as tax commissioner 1993, Tracy was fined $2,500 by the Ohio Elections Commission for his part in concealing campaign-fund sources during the time he was a county commissioner. In all, five Republican officials were fined following an investigation of illegal campaign-finance reports. When he died, Tracy was serving his second six-year term on the State Personnel Board of Review, appointed both times by former Gov. Bob Taft. A 1956 graduate of Grandview Heights High School and a 1963 Ohio State University law-school graduate, Tracy was an attorney in the Air Force Reserve from 1964-70. In 1959, he served on the White House staff as a special messenger to then-President Dwight Eisenhower.